Recent inaugural green senior non-preferred issues could represent the first green steps down the capital stack by financial institutions. 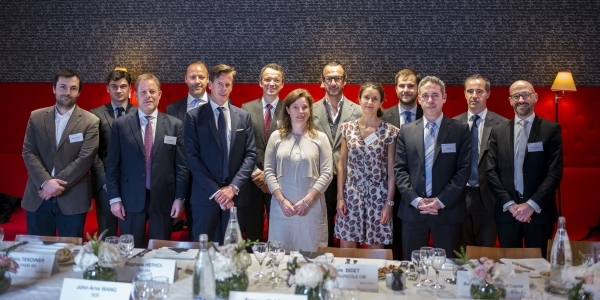 Crédit Agricole CIB and Bank+Insurance Hybrid Capital gathered together specialists in bank capital and green bonds to explore how green subordinated debt could work and help put the financial system on a path to sustainability. As this is a particularly long article, you may prefer to download the full magazine pdf here and read it in magazine format from page 24. Neil Day, Bank+Insurance Hybrid Capital: This is quite a new topic that we are discussing, with very little in the way of concrete examples so far. However, there are signs that green or sustainable bank capital could be coming along and reasons to consider its feasibility. Cécile, perhaps I could start by asking you to provide a backdrop to the discussion by outlining the trends that have brought green bank capital into focus. 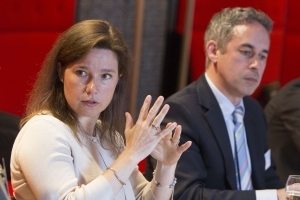 Cecile Bidet, Crédit Agricole CIB: The market for green and social bonds is booming. More than EUR100bn was issued last year, with financial institutions representing roughly a quarter of that. When it comes to green hybrid issuance, on the corporate side we have already had quite a lot of supply — from issuers such as Engie and Iberdrola that we were involved in — while on the insurance side we have seen some issuance, such as QBE with a gender equality bond that we were a bookrunner for. On the bank side, green hybrid capital would be something completely new — although we have seen green senior non-preferred (SNP), which could be considered as capital as it is bail-in-able. 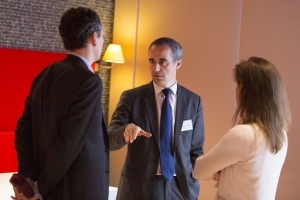 We were part of the inaugural green BBVA SNP a couple of weeks ago. And we’ve had green Tier 2 from a Turkish bank, TSKB. Is the banking sector going to catch up with corporates and insurance companies? This will partly depend on whether any impediments arise on the regulatory side. You can argue that senior non-preferred and Tier 2 are a gone concern instruments and that regulators may not have any issues with green versions, but for Additional Tier 1 (AT1) things may be more problematic. Day, BIHC: Perhaps we should start off by defining what we consider as green or sustainable capital. Do you think that senior non-preferred should be included since it is bail-in-able? Bidet, CACIB (pictured below): If you think about the loss-absorbing quality, you could consider SNP as capital. But that would be too simplistic. I think that if we are talking about capital, we are not talking about a funding instrument; we are talking about an instrument that is covering risk on the asset side. So we are moving away from funding to a leverage instrument, and the calibration has to be different. So, I would not consider SNP as a capital instrument. Capital is something that very clearly has to answer some regulatory rules on capital. 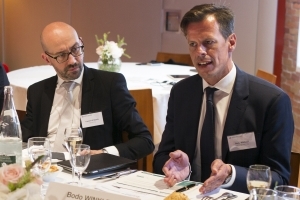 Bodo Winkler, Berlin Hyp: As a German bank we have thus far only been able to issue green bonds as senior non-preferred and not senior preferred — existing senior unsecured bonds are by law subordinate to deposits since Germany reacted early on to the forthcoming MREL requirements. So this was the only format in which we could do benchmark senior funding — any senior preferred would have had to be structured in some way and would not have appealed to the wider market. I’m therefore sympathetic to the view that this is a funding instrument — ultimately it creates liquidity and our intention was not to meet regulatory ratios or anything like that — and I would not consider it as capital. Stéphane Herndl, La Banque Postale Asset Management: The German case is a bit peculiar because of the route the authorities decided to take. I would argue that in some other European jurisdictions the only reason senior non-preferred was created was to protect a pure funding instrument. If these TLAC and MREL regulations were not there, banks would not issue senior non-preferred because there is a cost attached to it — they would just issue plain vanilla senior unsecured. In this respect the regulatory value should be the one that prevails. And it’s the regulatory aspect which means there might be some issues with labelling such an instrument as green, because there are strings attached to it. The proceeds are earmarked to fund certain green assets, and what happens if those assets are no longer there? Would that create some additional risks for the holders, like an incentive to redeem? At some point the regulators will have their say on this type of instrument and the risks that are created from such green implications. John Arne Wang, SEB: Personally, I don’t see any issue with doing a green senior non-preferred, and it would be a continuation of what we have already done. But while I can agree that it is a funding instrument, it’s also specifically set up in order to fulfil a buffer requirement. And while legally there’s no encumbrance as such in relation to green assets, you can always argue that you have moral encumbrance in terms of what you have actually issued, i.e. a green senior non-preferred. In a resolution situation the regulator should not differentiate between the green and the non-green senior non-preferred, but considering what has happened in some countries in terms of treatment of retail-distributed bonds, there is a risk that a political aspect could come into play under certain circumstances in some jurisdictions. One should not expect it to come into play, but again it may depend on how the regulatory and political climate develops vis-à-vis sustainable financing. As the asset class increases in volume, it should eventually become like any other instrument, meaning there won’t be any concerns about bailing in such instruments. 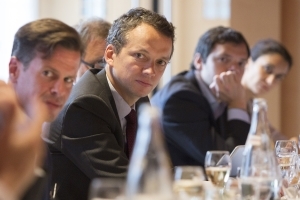 Tanguy Claquin, Crédit Agricole CIB: In the green bond market, whatever the instrument, it is always done in a way that the green instrument is pari passu to the others, so in the case of resolution it would be pari passu, too. That’s clearly the promise that is made to investors. You are buying a credit that is the same as the credit you would otherwise be buying if it were not a green bond, so by definition it is pari passu. Indeed, if you are buying an EDF green bond, for example, you know that the asset base that is supporting your bond is not only the renewable one, but the full balance sheet. Winkler, Berlin Hyp: When we speak of green bonds, we speak of “use of proceeds” bonds. That means I take the proceeds of these bonds to finance or to refinance something. So if my funding instrument is cheaper than a capital instrument, there is no need to take the proceeds of a capital instrument and channel them to finance or refinance green assets when I could refinance them through a covered bond, for instance, if they are eligible for my cover pool, or, if they are not, via senior unsecured — and senior preferred if it is available. Laurent Le Mouel, Moody’s: We clearly consider senior non-preferred to be a funding instrument. We make a clear difference between the ability of an instrument to absorb losses on a going concern basis — which is a characteristic of capital — and those instruments that absorb losses on a gone concern basis at the point of non-viability of a bank, which includes senior non-preferred. The first, capital, is something that reduces the probability of default of a bank, and we reflect that in our methodology in the intrinsic rating of the bank — the higher capital buffer, the higher the intrinsic rating. Whereas senior non-preferred simply ranks in a particular place in the payment waterfall in a resolution scenario, and the loss attached to this instrument is reflected in the final rating of the particular instrument. The fact that an instrument is green or not doesn’t change much in this respect. As Tanguy said, what is important is the credit risk attached to the instrument. Winkler, Berlin Hyp (below): And I think there is one other aspect, because even as a German issuer who starts with a very high MREL ratio, once our new insolvency regime is in place, we will still have the need in the future at some point to issue senior non-preferred even if we are well above my MREL requirement, just to make senior preferred not too expensive to fund in the end. Day, BIHC: Moving on to the instruments that I think everyone would agree are capital, like AT1, how do they need to work to be considered green capital? Can they be issued one-for-one against a pool of assets like green bonds to date, or should they reflect the capital requirement generated in relation to green assets, meeting the leverage component rather than the funding? Claquin, CACIB: Suppose that a bank raises EUR100m of AT1. This will be used to finance more than EUR100m of loans, so allocating it to just EUR100m of loans — as you would with a senior green bond — conveys a mismatch between what you are doing on the two sides of your balance sheet. So far we have seen different approaches. At Crédit Agricole, for example, we financed a large green loan book through a small equity tranche of a synthetic securitisation. That’s one way of looking at things. And then there have been transactions like QBE’s, where it was done on a one-to-one basis, despite the fact that on the one side you have an AT1 and on the other you have a portfolio of bonds — we know that QBE is using this capital for more than this portfolio, so there is a mismatch. Which is the right approach? It’s not an easy question. If you took an extreme case of a bank that only has green loans on the asset side, then of course they would be able to raise senior debt in green format and also AT1 in green format — globally they would have a one-to-one allocation and it would work. Unfortunately for the moment banks are not completely green — even if it will come — and so we need to manage that with a consistent message. I think it will be easier to raise a green AT1 if you are a bank that already has a large amount of senior unsecured outstanding, so you can say that you are raising AT1 to support your loan portfolio that is also supported by senior unsecured green bonds. It would in this way be possible to build a consistent message with a combination of instruments. It becomes a bit tricky if you have only green bonds outstanding and no green capital instruments, or only green capital instruments with no green senior unsecured. Winkler, Berlin Hyp: But what is the use of proceeds in that specific example? I would not really use the proceeds of AT1 or Tier 2 issuance to finance commercial real estate loans because I have cheaper instruments for doing so. But there is liquidity coming in when we issue these instruments, so what should I do with this? And the other thing, of course, is that given the low share of green assets on banks’ balance sheets so far, what are we speaking about here, a niche market? Claquin, CACIB: Yes, you are right: for the moment, it’s probably still a small market. But the size of green loan portfolios on banks’ balance sheets is growing. And regarding the use of proceeds, yes, the further you go down the balance sheet and into the capital instruments, the more difficult it is to allocate it. But if you want to be consistent, you need to have this leverage that Cécile has mentioned, and you need to communicate about this leverage in some shape or form. Because at the end of the day, when Berlin Hyp is extending a mortgage loan to anyone, it is financed, let’s say, 90% by senior debt, 5% by hybrid capital and 5% by some capital. So you should be able to communicate around this, even if it’s more difficult. Wang, SEB (below): The way we look at the green side of the balance sheet is as a virtual green balance sheet, i.e. both assets and liabilities marked green and the related hedges. As this virtual green balance sheet grows, you could introduce the same thinking when it comes to the capital to cover it. There are a number of challenges. One of them is that currently almost all green bond frameworks are very specific when it comes to use of proceeds and earmarking of proceeds — this has been an important principle since SEB initiated the green bond and when we ourselves introduced our framework as an issuer. And that aspect does not work well when it comes to capital instruments. As you said, if you raise green AT1 capital and use the proceeds, i.e. the same nominal amount, to finance for instance green buildings or wind turbines, that feels very challenging considering the actual instrument that you have issued. There is a significant mismatch right there. It would not surprise me if some banks opportunistically look at green capital instruments because they think it can give them a slightly different investor base or maybe even pricing benefits. But in order to move ahead with green capital instruments you first of all need to have a very sizeable green balance sheet, and then you have to develop the next step beyond current green bond frameworks, because the current use of proceeds concept does not work for a capital instrument in my view — definitely not for an AT1. Just to state the obvious, when it comes to AT1s, you don’t have perpetual assets, so then you have to default back to a very sizeable virtual green balance sheet to enable such instruments based on a new type of framework. As a dated instrument, Tier 2 could be easier. Claquin, CACIB: It’s true that the current frameworks are really linked to the assets, and in the case of banks, to the loans you are extending in the green sector. And it’s true that if you look at a perpetual instrument it creates an additional burden for the issuer, that they need to commit to continually replenishing and maintaining their portfolio. I think it’s not impossible to include that in the frameworks that already exist. Berlin Hyp has shown that it’s possible to have a living framework and improve it over time, and banks will have to go this way. But it’s true that there are some specificities that would be necessary for a framework for a green capital instrument. Michael Benyaya, CACIB: On the insurance side, which is an industry where we see green activity in general developing, we should move away from the funding aspect. What could work for them is a pure risk angle, where you take a look at your risk on the assets and liabilities — because effectively Solvency II is a full balance sheet approach — and you could effectively cover a pocket of green or sustainable risk with a specific green capital instrument. That is something that could potentially work for an insurance company more than the funding approach that we have seen so far with QBE and Manulife — that works on paper, which is fine, but it doesn’t really fit within the business model of the insurance company itself. You have to keep in mind that when an insurance company does an investment, they don’t invest their own money, they invest the policy-holders’ cash, i.e. the premiums that they have received from their policy holders. Insurance companies of course also issue bonds — actually mostly subordinated bonds but in fairly low volumes — but when they do that they aren’t doing it to make investments or provide loans in the manner of banks; they do that mostly for regulatory reasons, and very often they have very tight capital management guidelines which basically say they have to invest the proceeds of the bonds that they raise in super-high quality investments. So there is not a direct link between the big portfolio you see on the asset side and the bonds that have been issued on the capital markets. Day, BIHC: The possibility of the green nature of a capital instrument affecting its regulatory treatment was raised earlier. What specific issues might arise? Benyaya, CACIB: We have identified some potential regulatory hurdles when it comes to issuing green regulatory capital. The first one — which we have already touched on — is the concept of fungibility of capital. Bodo, I believe you said that capital is here to cover the full balance sheet and not only a small portion of it. That one is probably easier to address, in the sense that at the end of the day to me it’s more a question of communication than there being a pure segregation of assets and liabilities. You could communicate on equivalent amounts; you don’t need to have a segregated green capital allocation to a specific green capital requirement to make it work. Another potential hurdle that is probably more difficult is the concept of incentive to redeem, which Stéphane mentioned earlier. Because an incentive to redeem is not only a financial incentive to redeem — the definition can be pretty broad and could include a variety of items, and the regulator actually has full flexibility to interpret what constitutes an incentive to redeem in the context of a capital instrument. You could well imagine a situation where a bank or an insurance company issues a green capital instrument, and a few years later something happens, there is a full restructuring of the company, and the capital instrument ends up in the part where there are no more green assets. In that situation investors would probably put some pressure on the issuer to exert the call and buy back the instrument, simply because the initial purpose is no longer there. We think that one is something that could be a major hurdle for regulators to approve the issuance of green hybrid capital. Day, BIHC: I believe there was a utility that did a green bond but which is currently selling the relevant green assets. Even if that’s a corporate and not hybrid capital, it possibly offers an example of a similar thing happening. Claquin, CACIB (below): Innogy issued a green bond, but as a consequence of its acquisition by E.ON, its renewable assets could be transferred to RWE. Innogy green bond-holders may end up holding some E.ON green assets, but which remain to be defined and will be different from Innogy’s. So indeed, there is a question — not only linked to capital — about what becomes of a green bond if there are no more green assets. There are several answers to that. There is the pure legal answer, and if you look at the documentation of green bonds, most of the time the issuer has the right wording to cover for those situations, so that if they are not able to allocate appropriate green assets, they would allocate the proceeds to standard assets, or it’s on a best efforts basis — the wording is usually protective. The second thing is that this market relies more on the transparency and the accountability that the green bond creates at the issuer level, rather than the detail of the legal documentation. So it’s more a moral commitment than a legal commitment. And I would say that if an issuer is in this situation — which would typically be because of a major shift in their business plan — then if they are able to communicate the rationale transparently to investors they have done the largest part of the job. Then there is a further question, which is, is it possible to change the documentation of a bond so that you remove the green label? Can you change the use of proceeds of a bond during its lifetime to cover for this eventuality? This is a situation that we have studied, but the other way around, for some issuers that were considering transforming outstanding bonds into green bonds. They saw this market develop after they had issued but some part of their operation was already green, and they were considering transforming a large portion of their debt into green bonds, and it seems to be feasible in this direction. So why not the other way around? So without going into the specific resolution scenario that you have raised, I think that ultimately there are solutions issuers can find to manage such situations. Philippe Cazenave, Axiom: Clearly the trend globally speaking is that the regulators don’t want any kind of obstacle to resolution, so it’s very difficult for me to imagine a green capital bond that could have some seniority to classic AT1. Clearly it would be treated pari passu, and if it’s treated pari passu, there is basically no obstacle to resolution, no incentive to redeem, that’s very clear. Then, if it’s done on some sort of best efforts basis, why not? Let’s say I’m a bank with green ambitions, I want 20% of my global balance sheet to be green and 20% of the projects I’m financing to be green, so why not have 20% of some sort of green capital? It’s more on a best efforts basis so, as you said, it’s a question of communication. But I hardly see the regulator entering into a distinction between two capital instruments. Herndl, LBP AM: But wouldn’t the issuance of this type of instrument, even though it’s a soft commitment, create a reputational incentive to redeem because of the communication? You have built your whole communication on the fact that you are a green bank and then you have a problem, and you have to change the terms and conditions of your bond. Even if you are legally allowed to make these changes and you have only made a soft commitment to investors, I think there is clearly an issue there that will affect whether the supervisor considers that capital to be permanent. Cazenave, Axiom: This reminds me of the retail/non-retail distinction on capital instruments. Clearly from a regulator’s point of view, whether it is retail or non-retail is not important — it just has to be bail-in-able. But you’re right: from the issuer point of view there is some sort of incentive not to bail in the retail instrument. Herndl, LBP AM (below): Or even to just redeem the instrument if you lose the relevant assets for some reason. I think we agree that in resolution the treatment would be the same. But if, to ensure the permanence of capital, the regulator forces you to change the terms to make sure the capital remains in place and your bond is no longer green, what are the second round effects going to be on your cost of funding, because maybe your green investor base doesn’t trust you anymore? It’s a bit far-fetched, perhaps, but I think these are questions that need to be raised. Day, BIHC: Will the planned EU Green Bond label potentially make the best efforts more of a contractual obligation? Claquin, CACIB: The European Commission Expert Group will work on the taxonomy — what is green and what is not green, what is eligible as an asset in a green bond and what is not — and on the documentation aspect — what needs to be documented in various green bonds documents. Indeed they could also go into this area, i.e. the level of commitment that is undertaken in the documentation. Their mandate is still to be decided. Marjolaine Marzouk, CACIB: Last week we held the first conference on corporate hybrid debt and one of the panellists was Hervé Boiral, who is head of credit for Amundi, and a point he made was that for him what is more important when making an investment decision is the sustainability or “greenness” of an issuer, rather than the specificities of the green bond of the issuer. That’s how they are analysing the market and how they would like to see the market evolve, having green or sustainable issuers that have sustainable policies. Erwan Ollivier, HSBC Global Asset Management: That’s why there were difficulties with oil companies issuing a green bond. At the moment such considerations might not be that important, but they are becoming more and more so. Many clients are asking about ESG-related aspects, including the “greenness” of bonds, the carbon intensity of the issuer, and so on. The green universe is growing but it is still a small part of bond markets at the moment. It will probably take quite some time to develop without more pro-active industry initiatives or further regulatory changes. Cazenave, Axiom (below): As an individual, as a citizen, I’m very happy to see these discussions between rating agencies, issuers, asset managers around the environment. Then, as an asset manager, I do what my client actually needs, and what they are asking me today are two things. First, to make money — that’s the first point. So I try to be as efficient as possible. But what I have clearly noticed over the last three to four years is the vast majority of my institutional investors asking me, how SRI are you? What are you really doing? Is it useful from a money-making perspective, green bonds for the financial industry? I don’t want to be a controversial, but, frankly, I’m not so sure. But there is definitely a strong trend, so we can’t avoid at least considering these questions, and then seeing what we can do. In terms of SRI, clearly the consideration for us today when it comes to the financial industry is not really the environmental aspect, but much more governance, where we see a lot of risks. For the time being there aren’t really any or only very few green capital instruments and we only invest in capital instruments, but we are very happy to follow the trend. Wang, SEB: When it comes to green capital, it’s also important to take a step back and say, why do we issue a green bond in the first place? Most banks have very specific sustainability goals to support the overall climate goals. So in light of this aim, does capital have a role to play in this or not? I think it probably does in the next step, which is to say when there are incentives in place for green bond issuance and maybe even variable risk weight treatment, i.e. green supporting factors, which is ideally what should happen. If green incentives are implemented — which I think could be reality maybe not next year, but over the next few years — then green capital or at least further steps in the capital structure will come as a natural add-on as volumes of green loans are likely to increase significantly and at the same time it could make sense to discriminate between different parts of your lending, i.e. charging more for non-green lending. Green becomes the new normal. Winkler, Berlin Hyp: But then it would not even be green capital, but normal capital, because everything we do in the future would be green — anything else would be brown capital. I like the beginning of what you just said, why did we start issuing green bonds? And John gave the answer as well, it was to contribute to meeting certain overall targets, to help reach the not more than two degrees goal, for instance. And that task has already been fulfilled by originating the assets and refinancing them via a green bond. So what then is the task of the capital? Claquin, CACIB: Bodo, you ask this question, but you have the answer. Berlin Hyp is one of the examples where the issuance of a green senior bond — which may be seen by many as no more than a gimmick — has been a tool to transform the company. The management were convinced, made sure that green loans were incentivised on the lending side, green senior, green Pfandbriefe — the bank I know today is different from the bank I knew five years ago. And clearly if you start issuing green capital, it’s going to be a step further, because in fact you need this leverage. Green bonds is a governance instrument more than a green instrument, from an ESG perspective, because it’s a tool that transforms the way people are working, linking the treasury operations to the business operations, for example, and it’s even more true at the capital level. We have been discussing whether green capital makes sense for an issuer, but the green bond market has also developed a lot because investors were looking for green paper to invest in. One of the rationales for the first sovereign bond, for example, was that we saw it was not possible to do portfolio management in green bonds without this liquid instrument. So I would like to hear from the investors here if they would welcome the development of a green hybrid capital instrument? Is it something that would help you design new marketing angles and meet your clients’ interest in ESG? Ollivier, HSBC GAM (below): Our belief as a credit asset manager is that the green bond market must spread to other segments such as emerging markets or high yield. The amount of assets under management in green funds is not exploding — it’s OK, but you need to find some new opportunities, and at the moment the saleability of green bond funds continues to be undermined by their asset concentration (by industry) and by their very low beta and low yield, below 0.8% for the euro assets of the MSCI Green Bond Index today. Investors were expecting the green part of the business to develop more on the credit side. Quite the contrary: the inclusion of two recent sovereign deals into the MSCI Green Bond Index caused some disruptions. Notably, the EUR7bn of France Green OAT 2039 caused the index duration to jump from five to seven years. It is challenging for end-clients to not know what risk they will hold in the coming years. So we need to develop and to spread the greenness of the market to the widest possible range of products as possible, taking into account regulations and so on. We need to have a greater number of corporate issuers that will permit us to create a product that is easier to manage and sell. Day, BIHC: There have been suggestions that issuers might save a basis point or two when issuing green bonds. Is this the case? 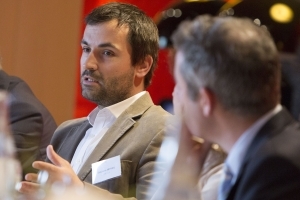 Vincent Hoarau, CACIB: When it comes to pricing, there is a never-ending debate. And there is the academic answer, and there is reality. The academic answer is that for a given issuer we are facing the same type of risk, so there should be no difference in terms of pricing between a conventional bond and a green bond. And in primary we see investors, including green investors, passing on deals if the new issue premium or the risk/reward associated with the transaction is not appropriate. But at the end of the day, the reality is a bit different. 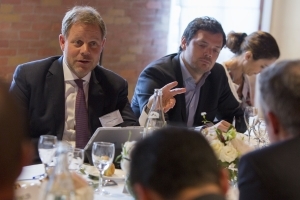 The answer on pricing would have been different a year ago, but the momentum around this asset class is growing and everyone around this table confirmed the fact that more and more end investors are delivering investment mandates to asset managers where the green and sustainable elements are becoming essential. I think that at some stage we may get to a point where there is an imbalance in the green demand/green supply dynamic in favour of issuers. And we may be there sooner rather than later Should this happen, this technical element will deliver a pricing advantage to issuers — even if it is in contradiction with the fact that both types of debt are pari passu. Bottom line? A green bond in primary means a greater investor base for the issuer, a greater level of granularity in the order book, and ultimately positive traction for the pricing. I think this pricing advantage will continue to be symbolic — if you ask me to put a number around this green premium, I would say it is in the low single-digits. If I screen the green curves we have in the secondary market today — the likes of SEB, Berlin Hyp, Rabobank, MUFG in HoldCo format — there is a differential of 3bp-5bp on a curve-adjusted basis — it can even go up to 8bp for names like Rabobank. Cécile mentioned at the beginning of the discussion the recent hybrid bonds from Iberdrola and Engie — clearly you see an outperformance of those bonds versus peers in stable but also in volatile markets. When I speak to traders, clearly they are not at all inclined to go short a green bond. So, due to all these positive elements, yes, there is a pricing advantage in favour of green transactions. It is still symbolic, but I suspect that it may grow because the need for green investments continues to increase, and I’m not sure that issuers will deliver as quickly as requested. Going forward, a greater number of investors may be inclined to sacrifice price for the green element. In primary we have seen traditional investors approaching pricing with a lower level of price sensitivity, simply because it’s a green bond, and because they suspect the bookbuilding dynamic to be different. Finally, in the event of a negative mark to market, you may not face the same type of pressure from management when handling a green bond. Marzouk, CACIB (below): We have regular discussions with investors who are collating data on the secondary market to see how green or sustainable bonds trade versus non-sustainable bonds, and at the moment there is no clear differentiation between the two. If you look at a specific issuer — for example in the utilities market, which has been pretty active when it comes to sustainable bonds — some green bonds are trading tighter than non-sustainable, and some others are trading wider. And if you look at the way traders send their runs — the Engie, Iberdrola runs, for example — it’s not specified if bonds are green or not, so it’s not something that is easy for investors to spot when they trade paper. This may indeed change as green considerations are growing strongly among investors. Insurers, for example, are really putting this at the top of their communications. For now, when we price a green bond, alongside green investors we have some non-green investors coming in just because they like the issuer, the maturity and all the other parameters, but what we notice is that issuers — not syndicate but issuers — tend to differentiate green mandates from non-green where possible, and sometimes give them a slightly better allocation, to help further develop this green community among issuers and investors. Hoarau, CACIB: From time to time — and this is where I see potential danger — we have issuers using the green element to try to approach pricing aggressively, and this is a road that we should be very careful about, and that should not be taken. 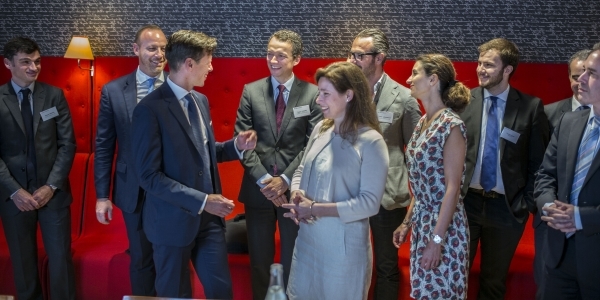 Berlin Hyp is absolutely on the other side of the spectrum, and tends to be consensual towards pricing and investor-friendly when issuing green bonds. Winkler, Berlin Hyp: I always find this quite an academic discussion because I’m not in the market with two identical instruments at the same time, one green and the other not. When we issued our last green senior bond we had the same discussions as if it had been a conventional bond: banks were telling us, OK, you have to add a new issue premium of such and such. But then at one point there was a question, what exactly do you mean by a new issue premium in a market that is more or less sold out, where there is no liquidity anymore? Are these levels on your screens underpinned by trades, or are they just quotes with nothing actually happening? That’s another argument why it is a little bit academic. And that is even more true when you go further down the hierarchy, because then you come to instruments that by nature do not have the same size, where there are even fewer comparables from issuers, and in many cases issuers do not have a curve of capital instruments that could serve as a basis for pricing something off. So then it becomes really quite hypothetical, trying to work out how the pricing of a green capital instrument — be it Tier 2 or AT1 — might compare with a non-green one. As Vincent said, our intention is to have successful deals and also see investors return in the next one. And if you squeeze the investor in the primary market, there is a very good chance that they will not return, and then over the long term your deal can’t be considered to have been successful. Therefore there has been no difference between our green deals and the conventional ones when it comes to pricing. And one argument I hear quite often from investors, which I really appreciate, is that if they are buying my name because it is a green bond, why should they be treated worse than another investor when they are buying the same credit? They should get equal treatment. In general we had larger order books for the green bonds, which of course helped the process. And what we’ve definitely seen is outperformance in secondaries. Wang, SEB: We have only issued one green bond so far — we will most likely issue another one later this year — and on this first one, I actually held back when it came to pricing. On the roadshow we preached about transparency, credibility and responsibility in what we are presenting within sustainability — it’s what we stand for, therefore it felt out of place to take advantage of the occasion to try to squeeze investors in terms of pricing. Clearly there is a mismatch between supply and demand, so I think it’s really up to issuers to show some responsibility in that respect. The funny thing is that several banks who were not on the deal openly criticised me afterwards for being too moderate in the final pricing. Winkler, Berlin Hyp: Don’t listen to them. Wang, SEB: Indeed, it’s more amusing than anything else. When you issue a green bond — just like when we talked about the capital element and the potential regulatory implications — there is a bigger responsibility that goes along with it. And if you conduct yourself in a manner that does not match your ESG language or what you are trying to preach, this should have some impact in the long run. You basically have to be transparent and responsible throughout the whole process. So I don’t see issuing green bonds in a beneficial perspective when it comes to pricing; I see this from a more strategic and moral angle. Moreover, I think that much of the pricing aspect — also the fact that no one dares short them — is because many of the issues are too small. Ideally we typically issue EUR750m up to EUR1.25bn in senior bonds, and ideally I would also like to issue EUR1bn in green bonds, but again it depends on the growth of green assets on the balance sheet. That’s really the factor limiting more large scale issuance. I can imagine that many of the representatives here from the investor side have to look at green senior even if they are not necessarily forced to buy it, due to client demand and requirements. In terms of green capital, this is far less obvious. We are not there yet — there are no natural demands to fill in your funds. So we could see a more interesting pricing exercise from that perspective. And then it’s a lot more to do with transparency, responsibility, how credible you are as a whole in terms of ESG, I would think. So overall it would be a very different price discovery type exercise than what we typically seen in the green bond format so far. 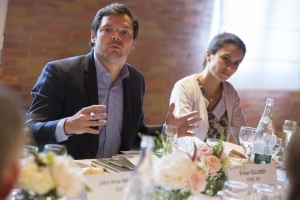 Claquin, CACIB: Our dedicated green bond analyst looked at precisely this pricing issue last month and his conclusion was that there is a consistent 1bp-2bp statistically significant difference in the secondary market, with green bonds trading tighter, but not in the primary market. However, it is statistically significant only for SSAs — where we have large volumes and a bit more liquidity — while for financial institutions and corporates we are more within the standard deviation so it’s difficult to draw a conclusion. Vincent is right that one year ago, one a half years ago we were not able to discover any price difference. We are now able to see something. It’s a moment in history that may change in the future, because of this taxonomy and EU Green Bond label that may be introduced. Once we have a quasi-regulation of this market with a list of eligible assets, documentation that is endorsed by the EU, and so on, then the incentives will be stronger and pricing could be influenced by the regulations. So we may then see larger price differences, based on whether or not bonds follow these rules, rather than technicals like supply and demand. Hoarau, CACIB: I would like to come back to BBVA’s recent senior non-preferred as an example. This transaction came to the market when we were already in a period of heightened volatility, and it was just a great deal in terms of momentum, book size, diversity and granularity, but also in terms of price tension and new issue premium. And BBVA’s green SNP priced on Santander’s conventional curve while similar issuers were paying new issue premiums in the double-digits in primary. Herndl, LBP AM: That’s definitely what we also see in the market. But — if I can play devil’s advocate here — there is still a risk attached to it. If you invest in a bond just because of its greenness, there is a risk that if the issuer behaves in a manner that is not ESG-compliant there will be controversy around the bond or it loses its green label, and that it underperforms. So on the technical side, yes, it does perform for now on the secondary market — when I talk to my portfolio managers they say they can sell green bonds on the secondary market more easily just because of the sheer demand for this type of assets — but at the same time it comes with tail risk. And that’s why we need to differentiate between bonds issued by issuers we consider ESG-compliant and those done on an opportunistic basis. Thomas Canel, HSBC Global Asset Management (below): Do you think that the price difference between green bond and conventional new issues will be higher for an issuer that is not itself deemed to be very ESG-compliant? Hoarau, CACIB: I think the benefit for such issuers will be limited. In the end, what matters the most is whether or not the borrower is considered as responsible towards environmental, social and governance criteria due to the nature of the business it conducts and how it conducts this business. Corporate image and reputation must be aligned with the overall funding strategy if the borrower expects a full impact of issuance in green format. Claquin, CACIB: In fact what this market has demonstrated over the last 12 months is that it’s about the assets more than the issuer, and Repsol is one of the examples of that. Repsol is very well rated from an ESG standpoint and is one of the best players in the oil and gas industry in terms of ESG procedures and standards. One of the reasons there was a debate about their bonds is because they financed some gasoline-related assets, so the question is about the relevance of the assets and gasoline value chain in a two degree perspective rather than on the quality of Repsol. On the other hand, we saw a green bond from China Three Gorges, a utility, that encountered controversy because of the Three Gorges Dam. Some analysts may have a negative view on what they did on the Yangtze River, but Three Gorges is also now a large utility and their green bond was done in relation to renewable assets purchased from EDP. There was no debate about the green quality of these assets and their trade was quite well received. And so to come back to your question, if an issuer which is not the best in terms of ESG comes with a transaction but the assets are prime assets, then I think — if it’s well done — there is a good chance that it is well received by investors. Day, BIHC: Would green capital be appropriate for private placements? Wang, SEB: We have not issued bank capital in anything other than benchmark format over the recent years, so you could say that in principle private placements from a capital perspective are not preferred. They are possible of course — a lot of issuers do them in certain currencies — but we try to keep things very simple as well since capital instruments should match the requirements on the balance sheet. If we one day were to issue green capital then, while it won’t necessarily be in private placement format, it will be in small sizes — unless we see the whole balance sheet becoming green, which is very unlikely to happen any time soon. The green capital to match our green balance sheet would for practical purposes be small amounts and way too small for any actual transactions as it looks now. Longer term this could obviously and hopefully change. What could very well happen in the end is issuance in niche currencies like Singapore dollars or Hong Kong dollars, where there are already numerous private placement capital issues — although these markets are not where you find the larger green investors, i.e. not necessarily the natural green investor habitats. In the main markets — the US market, the euro market — you could very well have to pay extra for small capital issues because there is no secondary liquidity and investors basically have very limited chance of getting out if needed. Green capital would also be about messaging, and that means that you don’t want to do a kind of camouflaged deal — that doesn’t make any sense. So from that perspective, it’s hard to deviate from a benchmark-like transaction. Winkler, Berlin Hyp: If I take this scheme Cécile prepared, the stylised green capital calculations we referred to at the start, nothing but a private placement would be possible for us, because in between I calculated that I would end up with EUR35m of Tier 2 and EUR26m of AT1, and that is clearly private placement sizes. On a more general basis, for many issuers green bonds are showcase transactions, and that means you want to make them visible to a wider public, so you don’t want to have them as private placements, because then nobody would know about them except one investor. That’s the case for us and is what I hear from a lot of other issuers: you use your best assets, so make sure you take the full marketing benefit from them. Claquin, CACIB: You are right, issuers have tended to favour benchmarks. But we have so many reverse enquiries for private placements and we have also seen some issuers achieving some good publicity in connection with private placements, so I would say this is a boundary that has been breached some time ago. Marzouk, CACIB: A few years ago we printed a green private placement for Schneider Electric, a 10 year, and the spectrum of investors who participated in the book was a bit larger than usual thanks to the green aspect, and the size reached EUR300m. Claquin, CACIB: Some insurance companies, for example, have targets to build a green bond pocket, and that’s a way for them to reach this type of name — Schneider is not a regular issuer and this was a way for them to buy into the credit. We used to have a market where we didn’t see many private placements; we see many more of them right now. For instance, the supras, and they are big issuers of green private placements — some banks, too, but less so on the corporate side. John Arne mentioned the Singapore dollar market — there was a green Tier 2 from Manulife in Sing dollars. You might not qualify it as a private placement, but it was more of a club deal than a widely distributed benchmark. 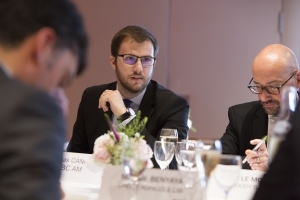 Hoarau, CACIB: When this imbalance between green supply and green demand crystallises, issuers may be tempted to accept cheap and tailor-made funding delivered by investors struggling to find assets and ready to scarify liquidity in addition to yield. Ollivier, HSBC GAM: To me, when it comes to green capital private placements, an important question, besides green or not green, is whether we can do private placements in funds. We need to have something that is liquid to enter UCITS vehicles. If not, we need to offer alternative vehicles and clients must accept renouncing liquidity to achieve more diversified green exposures. Bidet, CACIB: For banks that are issuing green bonds — with green capital being the ultimate green — shouldn’t that be taken into account in ratings? Because those are banks that have better corporate governance, and we know that governance is very topical at the moment. Laurent, how do you factor that in? And shouldn’t we see some uplift, maybe not in the instrument, but in the overall issuer credit rating? Le Mouel, Moody’s (below): We already take governance into account one way or another in our scorecard for banks. This can be if better governance leads to better financials — it can have a direct positive impact on profitability or asset risk, for instance. Or, if we think that one bank’s governance is better than another’s, we discriminate with a qualitative adjustment, and we could go down this route with banks issuing green bonds if there is evidence that it reflects better governance. 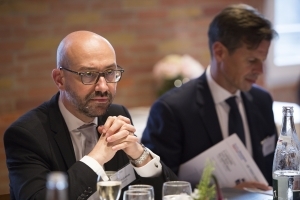 Winkler, Berlin Hyp: What I found interesting in the last credit opinion published by Moody’s on Berlin Hyp was that for the first time they mentioned in a positive way that we are an issuer of green bonds, even if this was not explicitly linked to any rating impact. Bidet, CACIB: Indeed, it’s not necessarily about the issuance of green bonds; it’s more the governance and the philosophy behind it, with green bonds being a symptom of such governance. Le Mouel, Moody’s: Overall this is quite a new topic for rating agencies. There is certainly now a higher sensitivity to these issues in our assessment compared to a few years ago. We also look at how sustainable and green factors directly impact the issuer, either positively — which can also be in governance as I just mentioned — or negatively, such as when a change in the regulatory environment potentially impacts car manufacturers, for instance. Then we have green or sustainable ratings attached directly to a particular instrument, such as green bonds. We have developed a green bond assessment where we assess how the bank is able to manage the green assets, to manage the proceeds, to report to the public, etc. Day, BIHC: To conclude: when are we going to see a green capital deal? Is this going to be a market that is going to take six months, a year, five years to develop? And are you likely to be getting involved? Bidet, CACIB: I strongly believe that within the next two years we are going to see something in the market. Banks are growing in this direction, the market is developing, and we’ve heard that we need to source more assets for investors. 2018 is a no-no, but it’s something for maybe 2019, or 2020 at the latest. Winkler, Berlin Hyp: You’ve heard my thoughts and it is simply not the same thing as green bonds. So potential issuers and investors first have to get their heads around the idea. I’ve spoken to some bond investors already, just to ask how they feel about it, and although many like green bonds, they said no, I cannot imagine it — so far; that could change, of course. So it’s not for today or tomorrow; it’s something for the future — but perhaps not too far into the future. Hoarau, CACIB: The day we have a deeply subordinated transaction in green format, you will tick so many boxes that the pricing differential will be substantial. The extra yield combined with the green element will attract deep green pockets. This is typically why BBVA went so well in quite challenging market conditions. Herndl, LBP AM: The further you go down the capital structure, the higher the chance you tap a different investor base. My understanding is that there’s a strong overlap between insurance investors and green, so while you may still be able to access this investor base with Tier 2 — with a bullet structure rather than callable because of the ALM constraints they have on the insurance side — I am less sure about AT1. Hoarau, CACIB: I fully agree with you. The only obstacle that may not be overcome by some traditional green investors is related to rating limits. How far you can go down the capital structure is a real question. Herndl, LBP AM: And don’t forget that we’ve seen recent capital trades being priced quite aggressively that have not really performed, so there is anyway a possible repricing taking place. And at the same time this is a new instrument, and for new instruments there is always a question of price discovery. So I hear the argument about the investor base being much bigger and there being this technical element that should support the performance of a bond, but at the same time there needs to be price discovery in a challenging environment with everything being very tight. So I’m not sure how this is going to balance out — and it also depends on what the market looks like at the time. Cazenave, Axiom: If there is at some point a green capital issuance, obviously we would be happy to have a look at it. I’m quite sensitive to your argument that there may be a wider range of investors involved in these. But, to be cynical, Tier 1 capital is a very technical instrument and if you have a wider range of investors, maybe you will have people that don’t fully understand the risks — not that this is a problem for us; we would be very happy to see more players on the ground.